Well, hello comrades of KNE, hello again to all of you who say to life the great YES, to all of you who are thrown into battle without asking for any praise, to all of you the glorious ones that all together sign with a Greek and worldwide hammer and sickle. In 2018 we welcome the 100 years of the KKE, the 50 years of our Organization, with firm belief and confidence in the struggle for the most glorious and important goal for social development; the struggle for the abolition of exploitation of man by man. We are determined that our future is not capitalism, but the new world, socialism-communism. The anti-capitalist, anti-monopoly struggle of the youth is timely and absolutely necessary and without this there is no hope of improving its life and conquering its social and individual rights. The 50-year course of KNE is the youthful storming of the future, for the new world, socialism-communism.  To demand what belongs to us, what is ours! We fight, we struggle, we rejoice life, because we want to make it better, beautiful, just, because our future cannot be a world of exploitation, crisis, unemployment, imperialist wars. We wage struggle of ideals stemming from our worldview, Marxism – Leninism, from values that withstand the passing of time, from ideas that are invisible because they are real, in spite of the times and myths aiming to reconcile the new generation with the historically outdated capitalist barbarity.  To meet up in all the places where our generation lives in, works, is being educated in order to strengthen the action, the organization and the struggle for a life with contemporary rights through trade-unions, school students’ communities, university students’ unions and vocational-training associations, in mass organizations in the neighbourhoods struggling for the needs and rights of the youth. 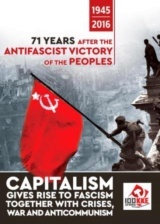  To learn about the proposal of the Communist Party of Greece for the overthrow of capitalism, the construction of a society of true freedom, of a life with rights, of socialism – communism, the proposal of struggle and action which we all have to follow today in order to build this perspective. We are confident that the 21st century will be the century of a new rise of the revolutionary movement and a new round of social and socialist revolutions. This course does not change, despite the current negative correlation of forces, in spite of the counter-revolution, the overthrow of the first attempt to construct socialism in Soviet Union and in a number of other countries. The course of social progress also entails setbacks. No social system has prevailed at once. 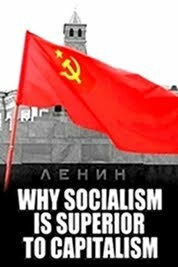 We study and learn from our experience using the positive and negative aspects that had determined the construction of Socialism and its overthrow in the previous century. Capitalism has no longer a future despite the fact that for nearly 30 years, after the victory of the counter-revolution, it dominates all around the world. The system of barbarity has rotten and it will be drowned into its own contradictions and inconsistencies the inter-imperialist competition, while a new cycle of economic crisis and recession, is looming. It will be drowned by the action of the revolutionary masses that will surely develop as such. Nothing can stop this evolution! Young men and women who experience the capitalist barbarity are those who will participate in and strengthen the social alliance and the armies of the revolution. Read the Declaration in PDF. We stand with a sense of increased responsibility and punctiliousness, collectively and individually, for the strengthening of the Communist Youth of Greece, the vanguard youth of the Communist Party of Greece, fighting on the road for the Socialist future.  With base organizations everywhere, in all the areas where the youth works, acts, are educated and lives in. In the majority of secondary schools, of technical and vocational schools, faculties and departments in universities and technical institutes, in training and apprenticeship places, in workplaces and businesses, in the cities, in the popular and working-class neighbourhoods and villages.  For a KNE rooted through the vanguard action of its members and its friends, in the trade-unions, the struggle committees, school councils, students’ unions, the people’s committees of the Social Alliance, in sports and cultural associations, clubs and groups of the women radical movement, generally in the mass organizations that can mobilize and rally the youth.  For a militant and strong KNE in order to prevent the deterioration of quality of life of the youth having as integral element the struggle for culture and sport, leisure and holidays. For an Organisation with rich interests, that promotes the vanguard radical art and culture, the multi-faceted educational activity, with the capability of rallying young artists. For a KNE active in sports, inside the sports centres, along with young athletes and young people who take part in sports activities. 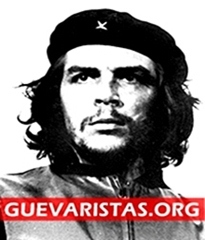  For a vanguard organisation that informs about and constantly fights against all drugs and that is at the foreftont of the struggle against the idealistic perceptions, the metaphysical beliefs and the sedation of mind and soul of the youth. That struggles against the alienation and the addiction to the Internet, which not only does not offer knowledge but also lulls and dismantles the will for collective action.  For a Youth Organization that will take care of their young friends in early grades of high school and in the last grades of primary school that are concerned about their school, their family, about what is happening around them. We set high goals for a more massive, more robust KNE ideologically, politically, organisationally so we can be more able to respond to the modern, complex needs of the class struggle, conquering through everyday struggle, the vigilance that we need in order to live up to sudden turning points and crossroads in circumstances under which the preconditions but also the requirements for certain masses of youth are created so they can get into unprecedented action, even if previously they had no involvement in such. 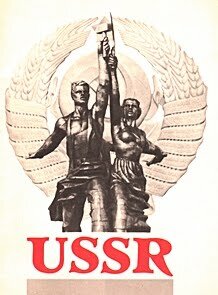  The unwavering faith in the struggle for the abolition of exploitation of man by man and the construction of socialism – communism, based on the valuable contribution and the critical assessment of the construction of socialism in the 20th century, the study of the causes of the counterrevolution.  The militant relations inside places where we can find young people, in schools, in universities and technical institutes, in training and vocational schools, work places and neighbourhoods.  The endurance towards the difficulties of the struggle. The resistance to the difficulties of the struggle, the dilemmas and the apparatuses of the exploitation system.  The ideological, political and organisational vigilance needed to cope in any condition of the class struggle, which is the motor for social development.  The courage in the fight for what “to some looks impossible”, in the conflict against the negative for the people correlation of forces that weighs on the consciousness of young people. The confrontation by also having consistency and faith in our cause against the dominant bourgeois currents ; the opportunist and reformists ones, anticommunism and all the outdated ideas presented as new and “modern”, by breaking the compromise and fatalism. The conflict against injustice by every member of KNE wherever they are.  The acknowledgement of the vast possibilities that exist today in the society, of the achievements of science and technology that have been created by the mind and hands of working people but also the acknowledgement of the obstacles that do not allow them to enjoy them, because the means of production belong to the parasites, the capitalists.  The vanguard militant stance concerning the acquisition of knowledge of the “road” needed to overthrow the world of exploiters. We have the weapons; we have the tenacity to succeed. 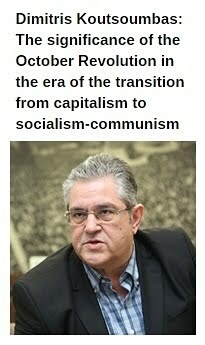 We must have as a valuable guide the heavy legacy of the history of the Communist Party of Greece and the International Communist Movement, we must draw conclusions and experience from it and, to go this experience even further, just like the previous did, and to justify it till the end. 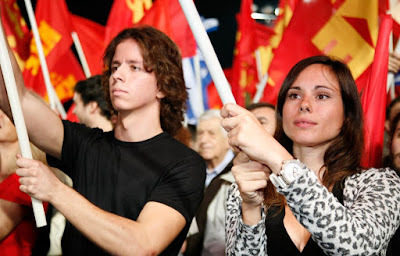 The Communist Youth of Greece was founded during the years of April’s dictatorship. Thus, the decision of the formation of the Organisation, taken by the Political Bureau of the Central Committee of the KKE in August 1968 was implemented. Firstly, the Central Office of KNE was formed and ‘Odigitis’ was published, and a year later, in October 1969, the 1st Conference of KNE was held illegally in Athens, where the Constitution and its Founding Declaration to the Greek youth was adopted and the Central Council and its Secretary were elected. The foundation of KNE took place in especially difficult conditions. The KKE was clandestine from 1947 while with the imposition of the military dictatorship in 1967 the persecutions and tortures against communists were intensified and thousands were sent back to prison and to exile. The KKE in the light of the historical importance of the 12th Session of its CC (1968) refuted the opportunist attempt of various cadres aiming to dissolute the Party and decided to reconstruct the Party Organisations. It was the first time after the self-dissolution of OKNE (1943), that an organisation with Marxist-Leninist characteristics was founded , aiming to be the vehicle of the KKE’s policies inside the youth, primarily the children of the working class, to educate the sections of youth with the principles and ideals of class struggle, i.e. the goal of socialism – communism. The fact that for a long time, from 1943 to 1968, there was no independent Communist Youth Organisation was an obstacle for the communist work inside younger ages. It was especially difficult for the renewal of the ranks of the KKE with new members and cadres, for the Communist education and strength in front of difficulties, against parliamentary illusions. The History of the Party shows that the existence of KKE as a revolutionary party in any circumstances is a timeless need (e.g. in conditions of bourgeois parliamentary democracy, illegal action, open dictatorship, imperialist war). Respectively, there should always be an Organisation of the Communist Youth guided by the Party. No other organisation can substitute the need for an independent existence and action of the Party and the Communist Youth. It inherited the militant traditions of the people and the youth. It is the continuator of the heroic OKNE, the successor of the militant traditions of EPON (United Panhellenic Organisation of Youth) and the Democratic Youth (DNΕ) of DSE (Democratic Army of Greece), of the militant action of young communists under other conditions in massive political organisations such as Lambrakis Democratic Youth (DNL). OKNE (Federation of Communist Youths of Greece) was founded in 28th November 1922 in Thessaloniki on the initiative of SEKE (Socialist Workers Party of Greece), which in 1924 was renamed to KKE. From the first moment, it became part of the Communist International of Youth and developed internationalist action. The founding of OKNE gave a political and ideological direction, an impetus to the rise of youth struggles with its own demands by the side of the labour-people’s movement. It contributed so sections of the youth could come for the first time into contact with the revolutionary ideas, the Marxist-Leninist worldview, namely the scientific communism. It spread its action to the places where the youth lived in, worked and was educated. It promoted and educated the youth with unprecedented, new ideas and slogans about the importance of knowledge, education and culture, about the importance and the role of the working class, the gender equality, the revelation of the hypocritical morality of the bourgeois class concerning the issues of love, family and marriage. It was the basic source of recruits for the KKE; it raised thousands of unknown and famous heroes who were its own creation, whose unbowed stance in the struggle against social injustice, for the liberation from the shackles of the exploitative system is a huge source of inspiration and teachings for today’s struggle. This kind of example is the case of the communist soldiers – members of OKNE – that stood unbowed at the hellhole of the “Disciplinary Platoon” of Kalpaki during the decades of 1920 and 1930. There are also the examples of Christos Maltezos, Secretary of the CC of OKNE that at the age of 30 was murdered with horrific tortures in the prisons of Corfu, of Ilektra Apostolou that was murdered in the Police Station in 1944, of Napoleon Soukatzidis that was executed by the Germans as one of the 200 communists at the firing range of Kaisariani and many others. On February 5, 1942, on OKNE initiative, the National Liberation Front of Youth (EAM Youth) was established. On February 23, 1943, a meeting was held with the participation of representatives of all youth organisations that participated in EAM Youth, as well as other organisations, which resulted in the decision to found the United Panhellenic Organisation of Youth (EPON), with the dissolution of all the youth organisations that participated in its foundation. Thus, with the establishment of EPON, OKNE was dissolved after 21 years of heroic action. EPON developed an enormous heroic national liberating, educational and cultural action, and gave to the youth unmatched examples of self-sacrifice and popular solidarity. More than 32,000 members of EPON fought in ELAS (Greek People’s Liberation Army). On the eve of the liberation, EPON numbered 640,000 youngsters together with Aetopoula (members of EPON of the ages 12-15). Thousands of members of EPON died heroically at Hitler’s camps and at the battles against the conquerors and the Greek collaborationist military groups. Most of the members of ELAS of Athens and Piraeus were members of EPON and half of the dead members of ELAS were members of EPON. During the armed class conflict (1946-1949) between the Communists, the thousands of other militants and the popular movement on the one hand and the bourgeois class with its foreign allies on the other, alongside the Democratic Army of Greece, the Democratic Youth of Greece (DNE) was created in the mountains. The DNE had a significant contribution to the battles of DSE, but also to the educational and enlightening work in the youth of the Liberated Greece. At the same time in the cities, and until 1957-1958, the illegal now EPON continued to act, carrying considerable weight of the work of the Party in the youth on its shoulders. At the same time, after the foundation of the United Democratic Left (EDA), the United Democratic Youth of Greece (EDNE) was formed in 1951. The organisation was dissolved by a decision of the Commission for National Security approximately one year later, under the Compulsory Law 509/1947. Later it was succeeded by the EDA Youth, which, after the murder of Grigoris Lambrakis in 1964, merged with the newly-founded Youth Movement-Grigoris Lambrakis and thus the Lambrakis Democratic Youth (DNL) was created. These organisations undoubtedly played a positive role in the struggles of the youth and the people at that time, such as the rallies against NATO in 1958 and 1959, the strikes of the construction workers in 1960, the struggles for education in the period 1961-63 with the slogan “1-1-4 “(this is how they are known the vast school and university students’ mobilizations that broke out in 1963, with main demand 15% of the state budget to be given for the education). With respect we bow: to those who fought for the people’s interests in all conditions; to all of those who held a heroic stance with the gun, or with the makeshift megaphones, who took part in the protests, the strikes, the sabotages, who were persecuted, imprisoned, exiled, executed, who were unbowed and taught us a proud, heroic way of life; to those who showed the form of the devoted and unwavering fighter, i.e. the characteristics of a rebel. KNE is the vanguard youth and its struggle looks up the future, because it is the Youth of the working class’ Party, of the Communist Party of Greece. Besides, the KKE itself is the Party that expresses the interests of the majority of the youth, because it brings to life the most new and innovative creation of the human mind in the worldwide social development; the scientific communism, the struggle for the transition of man from “the kingdom of necessity to the kingdom of freedom”.Throughout its 100-year life, the KKE was greatly concerned with the life and problems of the new generation. It showed the only way that can bring results, raising thousands of young militants and pioneers in the daily struggles, shaping personalities that do not subordinate to fatalism and compromise. By the side of the KKE, KNE gives the struggle with pride and responsibility, puts all its forces on the propagation of the Program, the positions and the elaborations that concern the general and specific problems of the youth, its interests. It has a special responsibility to specify the Party’s strategy, its positions to the youth, and also to help the Party to enrich its positions and elaborations with the knowledge and experience that KNE’s organisations gather since they direct their action exclusively towards young ages. KNE struggles for the overthrow of capitalism and the construction of a socialist-communist society in which any kind of exploitation of man by man and any form of capitalist property will be abolished and a higher level of life and rights will be secured. Because, today, the actual new and innovative is the existence of a society where young people can satisfy their modern needs, with equal opportunities and rights, where they can develop allround their personality, where they can utilize their abilities and participate in a pioneer way in the construction of the new, socialist-communist society. KNE works tirelessly so the youth can realize the possibility and the necessity of such a society and for the connection of its struggles with this prospect. This character of KNE was the main factor for the fact that it rooted and gained great prestige and influence in the youth. The character of KNE as the youth of the KKE is the key factor that gave and continues to give to the organisation its strength, endurance, steady course, despite the many difficulties that arose in various periods. KNE was able to become a leader and organizer of the struggles of the wide masses of youth alongside the working class. It continues steadily for the raise of the demands of the young generation, for the organisation of the struggle for the life that they deprive from us, for its radical direction and its connection with the class-oriented and the people’s movement in general. For the youth struggles to be linked to a “thread” with the struggles of the previous generations, for the preparation of even more dynamic, more massive struggles for the serious conflicts against the real enemy, for the victory of the working class and the overthrow of capitalism. The youth can play an important role in overthrows, in improving the correlation of forces when it is permeated by class struggle and revolutionary ideas. The sections of youth and their movements, their struggles, had a major contribution when, without sacrificing their particular characteristics, they consciously walked side by side with the working class and its allies, the urban and rural self-employed. This is what the dominant class is so afraid of. This has been demonstrated throughout history, in certain phases and conditions characterized by the rise of the labour movement, when its struggles, emerging from the contradiction of capital-labour, also gained political content. Moreover, today, KNE has an action inside schools, universities, vocational training centers, in the working and unemployed young people so that militant youth forces can contribute to the regroupment of the labour movement, the social alliance of rupture and overthrow. It seeks its action to acquire a character of militant, educational-cultural counter-attack, by shaping a corresponding current in its ranks and, more broadly, in the youth. 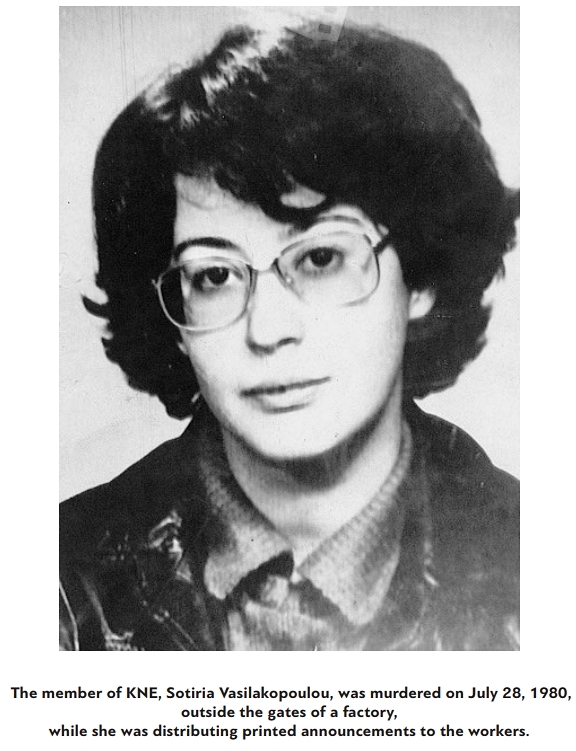 The foundation of KNE gave life to the action of the KKE inside the youth and the anti-dictatorship struggle. The formation of illegal organisations of the KKE but also of KNE in youth places influenced the development and the rise of the university and school student movement, the organisation of the anti-dictatorship struggle in these places. 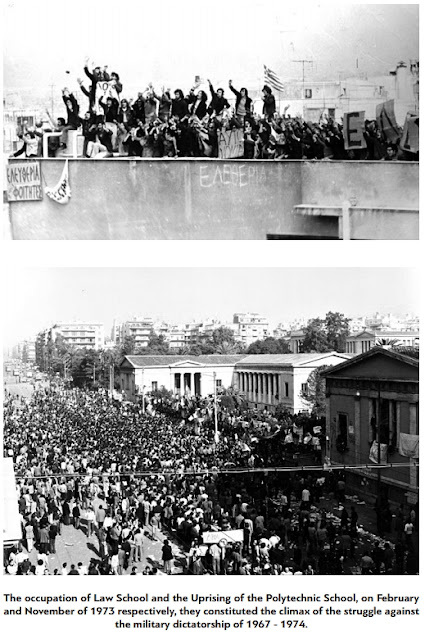 On KKE’s and KNE’s initiative, the Anti-Dictatorship Students’ Union of Greece (AntiEFEE, with its organ the newspaper “Panspoudastiki”) and also the School Students’ Organisation of Democratic Youth of Greece (MODNE) were founded, which gave great impetus to the rise of the anti-dictatorship struggle, from the occupation of the Law School building (February 1973) that was culminated with the Polytechnic uprising in November 1973. It met the raging reaction not only of the dictatorship but also of the forces of the revisionist team that split from the KKE in 1968, which were disseminating that “KNE disunites the anti-dictatorship youth movement, it is not needed”. In the years following the re-establishment of bourgeois democracy, KNE grew stronger at the side of the Party. The decision of the 4th Session of the Central Council of KNE played a crucial role mentioning inter alia: “Each member of KNE must form a Base Organisation (BO)”. KNE grew rapidly, it formed BO all over the country, focusing on the major urban centers, putting its mark on the militant rise of the youth, on its struggles and demands alongside the labour-people’s movement. In the struggles of pupils, students, young workers, students in technical-vocational schools, in the anti-imperialist struggles against the EEC (now EU) and NATO, for the removal of American bases, for the international anti-imperialist solidarity, for peace. It was at the forefront for the defense of socialism against bourgeois and opportunist attacks, for solidarity with the socialist countries. It had a pioneering contribution to the regroupment, the militant direction and the creation of thousands of new mass collective forms of action such as students’ unions, school students’ communities, young workers’ committees, cultural and educational associations and others. It raised young pioneers in the youth struggles and it gave new “immortals” like Sotiria Vasilakopoulou, a member of KNE that was murdered at the gate of the ETMA factory. After a rich inter-organisational process and discussion and as a result of a wide-ranging action – amongst them the 1st Festival of KNE-Odigitis in 1975 – KNE reached its 1st Congress, which started its works on February 18, 1976. The 1st Congress was a big step forward for KNE. It was a very important event for wider masses of youth. As stated in its resolution: “The foundation of KNE, following the decision of the PB of the CC of the KKE... signifies the beginning of a higher phase for the youth movement in Greece. It has been an important milestone for the general development of the revolutionary movement in our country…After 7.5 years of existence and rich action”, as stated in the resolution, “KNE is a motor force inside the youth movement, it is its Marxist - Leninist vanguard, the solid link with the movement of the working class and its Party”. The 1st Conference, with its resolution, confirmed as a first task the direction of KNE in the working youth, and the children of the working class. It strengthened the confidence of young communists for the irreplaceable role of the labour movement in the revolutionary change of society. All subsequent conferences (2nd-1979 and 3rd-1983) were steadily engaged in the problems and concerns of young people, the propagation of the Party’s policies inside the youth, the vanguard action of the members of KNE in the various youth movements. The course of KNE is objectively inseparable from the course of the KKE, is overall inseparable from the course of the formation of its strategy. From this point of view KNE was also influenced by the counterrevolutionary overthrows in the socialist countries during the period 1989- 1991, as well as by the crisis that the KKE experienced during the same period, due to the influence of the organized opportunist action, which was aiming to relinquish the revolutionary characteristics of KKE, to transform it into a Social-Democratic Party, and eventually to be diffused into the “Coalition of the Left and Progress”. Despite the obstacles and difficulties, KNE has endured in the storm of the counter-revolution. KNE managed to endure because the KKE stood up “against the stream”, keeping the flag of the class struggle, the fight for socialism – communism up. We are proud that our Party, despite all those who would like its dissolution or its incorporation into the system of bourgeois power, was able to stand up in these unprecedented, difficult conditions for the international communist movement. It did not bow to the sirens of compromise. 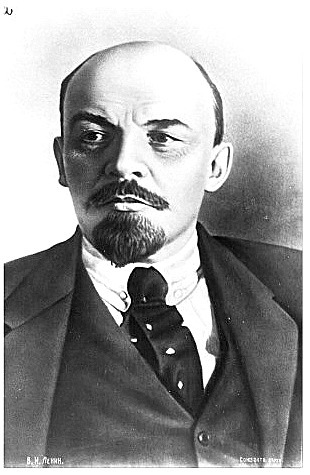 It defended the fundamental principles and characteristics of a Communist Party, the worldview of scientific socialism- communism, Marxism - Leninism, proletarian internationalism, the democratic centralism, the laws of the socialist economy and society, principles that were at the centre of the anti-communist and opportunist attack. It opposed nihilism of the course of the socialist construction in the 20th century, highlighted the contribution of socialism and the workers’ and communist movement, the timeliness of class struggle as the only motor force – for the liberation of the working class through the abolition of capitalist ownership of the means of production - for the conquest of the political power and the construction of socialism-communism. 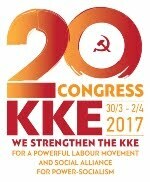 Thanks to the regroupment of the KKE, KNE managed to overcome problems and confusions that were expressed during its Congresses (4th Congress -1988 and 5th– Extraordinary Congress 1990), concerning the questioning of the political and ideological Party’s leading role in KNE, a questioning of the very nature of the Organisation. The Party’s crisis also led to the attempt to change the character of KNE, to dissolve it and diffuse its forces within Synaspismos (Coalition of the Left and Progress) or a wider so-called “left” youth. These efforts brought KNE on the verge of dissolution resulting to two splits in 1989 and 1991. KNE managed to regroup and to begin its course for becoming a more strong and massive Youth Organization. With the support of the Party and also its own experience, KNE made steady steps to strengthen its revolutionary characteristics, to improve its capacity to intervene within the youth of the working - popular forces. Of particular importance is the 6thConference (1993) and the militant effort of hundreds of members of KNE throughout Greece to rebuild Base Organisations, to regroup KNE, to keep the slogan “our future is not capitalism, it is the new world socialism” alive. The bases for the regroupment of KNE were greatly strengthened by its 7thCongress (1997), where the adoption of a new statute of the Organisation, which is the basis of the present Statute of KNE (voted at the 11th Conference in 2014), stands out. It did not take too much time for KNE to be recognized again as a vanguard, militant, organisation of the youth. This became possible with the hard work of the members of KNE, who had a complete ideological - political and organisational support and help from the KKE. 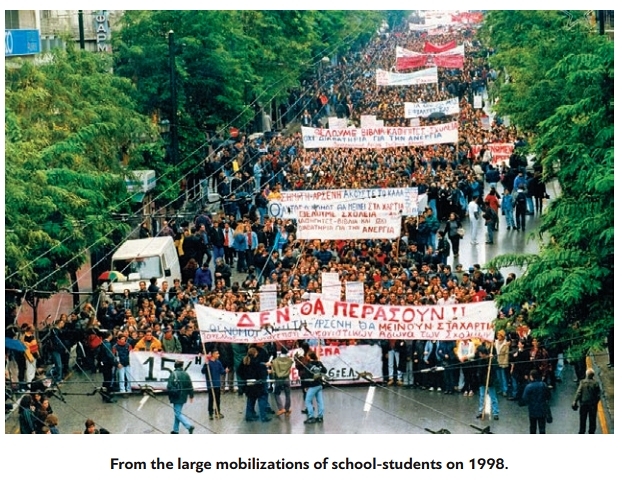 The contribution of KNE is irreplaceable, in every small and bigger struggle of school students, particularly in the major mobilizations of 1998-1999, of university students, of young people from vocational schools, from night schools for the rise of demands and collective action. In addition, their contribution in the direction of the struggle is also of great importance so the youth can walk side by side with the class labour movement and not be assimilated by the system. KNE, since the first years of the counter-revolutionary overthrows, has fought against wars (Yugoslavia, Iraq, Afghanistan, etc.) and the plans of the imperialist states and unions (NATO, EU, etc.) concerning the participation of Greek armed forces outside the borders, against the rise of nationalism, so that the youth will not bow before a flag which does not bear its interests, so that they do not support any bourgeois class. This action embraced the youth of the working class, school students, university students, young workers and young soldiers. KNE organized international solidarity, with both support and practical action, with brigades of solidarity to struggling peoples. 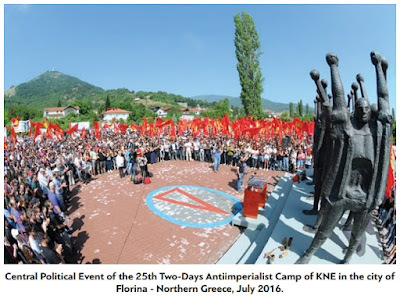 In this framework, the anti-imperialist two-day event of KNE was established as an institution since July 1992 in Prespes, Greece. It fought against our country’s participation in imperialist transnational unions, such as the EEC, later EU, in terms of action and awareness, highlighting that the European Union cannot become pro-people, nor it is founded for such a purpose. Since it was founded, it is and always will be against the people and the youth, because it is a union of the exploiters and their governments against the peoples. The course of establishing positive steps, responding to complex developments and opening up new possibilities, went along with the persistent effort to strengthen its revolutionary communist characteristics, in order to be inspired by the revolutionary perspective and to raise the ability to educate thousands of members and friends of KNE for this purpose. This kind of experience is reflected in all the congresses of KNE until today (8th2001, 9th-2006, 10th-2010 and 11th-2014). Since its foundation, faithful to the principles of proletarian internationalism, KNE has developed rich relations with Communist Youth Organizations from all over the world, while since 1970 it has been a member of the World Federation of Democratic Youth (WFDY). Particularly after 1991, it has played a leading role in enhancing the discussion and joint action of the Communist Youths worldwide. 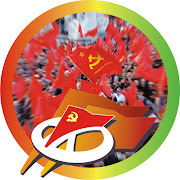 KNE continues to take on and promote initiatives such as joint announcements of Communist Youths, international ideological seminars, meetings of Communist Youth Organizations of Europe, other forms of collective discussion and joint action that the need and common steps of the Communist Youths will bring to the fore. 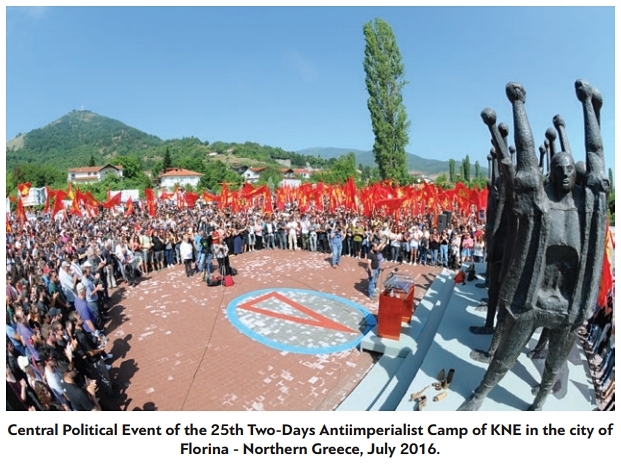 Since 2013, the KKE at its 19th Congress was equipped with a new Program and a new Statute, which together with the resolutions of the 20th Congress in 2017, are indispensable assets for the strengthening of KNE’s action and intervention. The intensity of efforts for a vanguard and mass action in all sections of the youth went and still go hand-in-hand with new challenges that KNE must at all phases respond to, to be strengthened as the vanguard youth of the KKE. 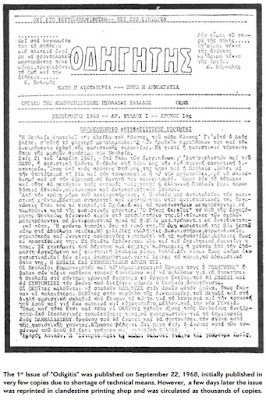 Along with the formation of the first leading organ of KNE and its first Organisations, its “comrade” in action and struggles, its newspaper, “Odigitis” is published, an organ of the Central Council, an organizer and leader to this day that was first released in September 1968. It is no coincidence that the first issue of “Odigitis” was released only a few days after the foundation of the Organisation. 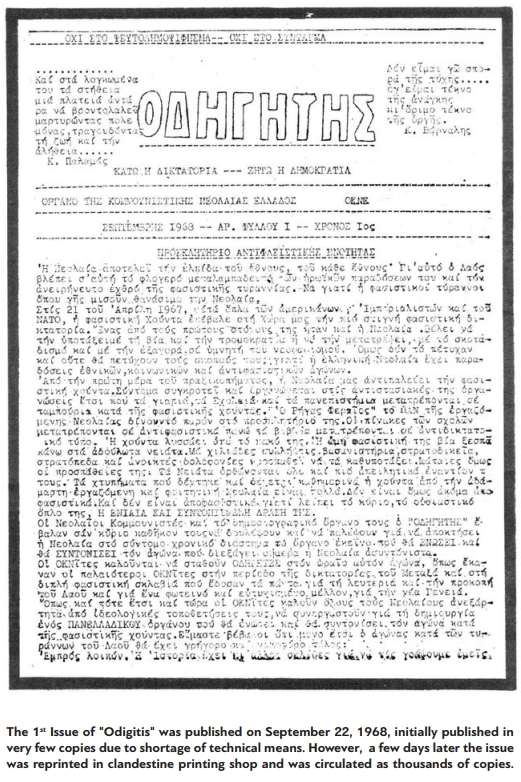 The stubbornness, the ingenuity, the militant spirit that “no difficulty will overcome us”, the compliance to the rules of secrecy, the combination of illegal and legal work, the initiative, made it possible for “Odigitis” to be written and printed , with news as well as reports from all over Greece, which was distributed hand to hand. KNE, with the decisive contribution and assistance of the Party, secured the creation of an appropriate mechanism to ensure the printing of “Odigitis” and other KNE materials. The newspaper had to come out in every way, at all costs, and it did. The action with these features established KNE in the conscience of the people, secured contact with thousands of young people. Thanks to this difficult but vanguard action, “Odigitis” and KNE materials were printed, even during the junta period. Thanks to this action and despite the raid of the police at its printing place and the interruption of the circulation of “Odigitis” in 1971, a new printing place was rebuilt in 1972 and “Odigitis” continued to be a real militant voice within the obscurity of persecutions and illegality, along with “Rizospastis” and other party publications. “Odigitis”, from the very first moment of its circulation until today, contributes decisively to the militant promotion of the policies, ideology and positions of the KKE and KNE in the youth. It informs and enlightens about the problems of the youth and their causes, about the demands and the needs of the youth against the distortion and disinformation of the bourgeois mass media. It contributes to the generalization of experience from the activities of KNE Organisations. For these reasons, “Odigitis” is a mass organizer and guide. Today it is the only youth publication that “talks” about the problems and struggles of young people and highlights the way out under the point of view of the working class. The aim is that “Odigitis” is distributed everywhere: at every workplace, neighborhood, school and university. 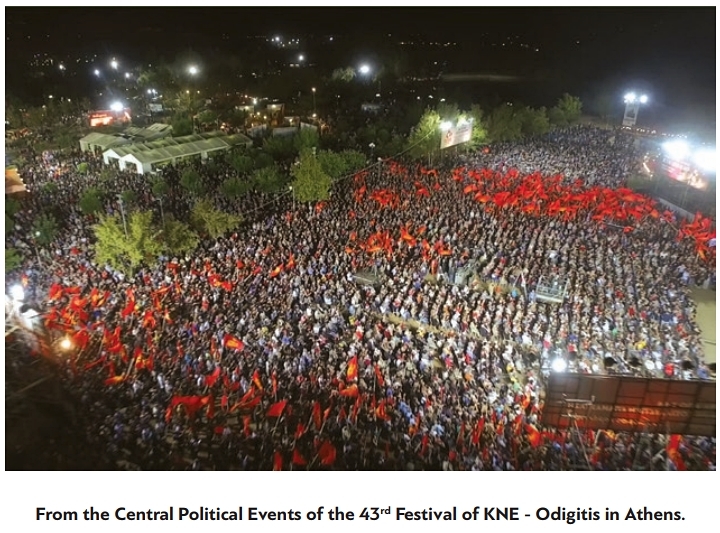 The example of KNE- Odigitis Festival has been emblematic throughout the course of KNE; it has been bringing thousands of young people in contact with the most innovative ideas, with the history of the Party, the movement, with the heroism of those unbowed by the class struggle, the fights that inspired a glorious artistic work of international impact. The KNE-Odigitis Festival in its 40-year-long journey has put its mark in our ideological, political and cultural intervention in the youth. It has always combined militant education with engaged, progressive art; the creation and more broad expansion of our bonds with young people, especially with artists, cultural and sports groups, communities of drug-addicts rehabilitation, mass collective organisations. This is a distinctive feature that contributes to the prestige of the Festival itself, its establishment in the consciousness of thousands of young people, even generations, as the largest politicalcultural youth event. The Central Council, all cadres and members of our organisation, warmly shake the hands of all the comrades who helped KNE to take root in the youth of our country, from the years of the dictatorship until today. 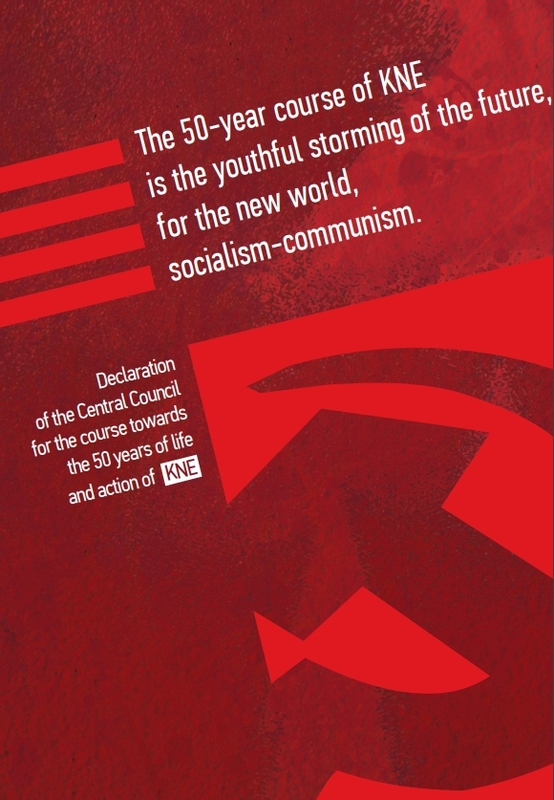 KNE reaches 50 years of life and militant action with more optimism and determination! The struggle for the mind, conscience, heart, attitude and action of the youth of the working class and the poor popular strata is a key element of the class struggle between the working class and the capital. We are well aware that they do not only want the youth to be ignorant and neutral. They want the youth to actively support the exploitation system, the imperialist wars and the slaughter of peoples for the profits of the business groups. They seek for them to accept that their future will be crushed in the mills of profitability and antagonism of the exploiters, at a time when the development of production based on modern technology can ensure work for all, with a general reduction in working time and a level of production and services to meet the modern needs of young people and older people. In this effort, we are struggling against the general tendency of society to substitute knowledge for information, the way in which the bourgeoisie, with the help of the new means of communication and technology, attempts to educate on individualism, subjectivity, inertia of thought and action. Against the rotten values and ideals of the system, the KKE and KNE, in actions and not in words, have highlighted and still highlight thousands of examples to follow: Thousands of role models of young modest fighters, pioneers in education, culture, struggle. Young people with deep sense of the value of collectivity, with deep love for the people of labour, enemies of wealth and decay, with deep love for the oppressed all over the world, with deep faith in the fair cause of the worker, with optimism even in the more difficult conditions that the world can change, with a deep knowledge of reality. Each member of KNE «shall» use and distribute time so that, with the help of knowledge and experience from the active participation in the movement, to contribute as broadly as possible in order for the young people of the working class and popular strata to see the objective reality in a class-oriented base, without all the ideological “cesspool”. By studying and utilizing the Party’s documents, with the incisive observation of the impact of bourgeois ideology on youth, we conquer the capacity of informing in a creative and understandable way, taking into account the level of consciousness of the young people. We can convince more than we have achieved so far, to raise questions and doubts over the dominant propaganda to even more young people! Although today’s youth is surrounded by conservative regression, anticommunism, the ideological attack against the revolutionary, labour movement and the vanguard role of the working class - especially after the 1991 socialist overthrows - its future for a better life to satisfy its needs is directly linked to its participation and contribution to the development of class struggle, the overthrow of capitalist barbarity and the construction of the new, socialist society. The time has come for action! KNE, the Youth of the KKE, is here! It has a clear struggle proposition, has proposals and positions on all issues that concern the young people of the working-popular families. Everyone counts in the big struggle we have in front of us! Every youngster organized in KNE signifies a big failure of the system to put him in its pocket, to neutralize him! It means that no one will be alone against the system of exploitation and deception. The organisation multiplies the strength of each and every one, in the struggle for a future “in the level of our dreams” and our needs!